As we learn in A Ballerina’s Tale, Nelson George’s new documentary about Misty Copeland [February 8; check local listings], Eurocentric standards of body shape, muscle tone, and skin color excluded dancers who didn’t fit the wan mold demanded of prima ballerinas. All that changed in the summer of 2015, when Misty Copeland, a rising star already transcending the rarified world of classical dance, became the first African American woman to be named principal dancer at the prestigious American Ballet Theatre, the 75-year-old grande dame of ballet in the United States. Misty jetéed through more barriers last year on the Kennedy Center stage when she partnered with 28-year-old Brooklyn Mack, who played Prince Siegfried in Swan Lake alongside Misty’s Odette/Odile, marking the first time two African Americans danced the lead parts in a production by a major ballet company. 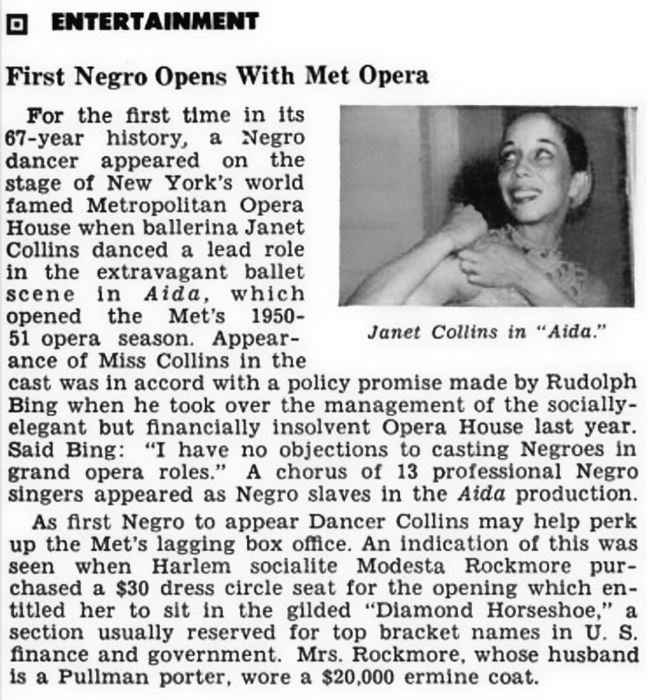 Before Misty, few African Americans have ever danced in the principal position at a major American ballet company. All but one were men. Desmond Richardson held the post with ABT during the 1997-98 season and returned as a guest artist later. At New York City Ballet only Arthur Mitchell (1962) and Albert Evans (1995) featured as principal. Evans died recently at the young age of 46. Yet dancers of color, determined despite facing terrible prejudice, have stood en pointe on stages across the world. Here’s a survey of, and salute to, some of the those who blazed the path before Misty. Raven Wilkinson, who appears with Misty Copeland in A Ballerina’s Tale, was one of the first African American ballerinas permitted to join a ballet company. During the 1950s, she danced with the Ballets Russes de Monte Carlo under the condition that she pose as a white woman by painting her face. After two years of increasing racial discrimination, including threats in the South, she left Ballets Russes and eventually landed a spot in the Dutch National Ballet. How did you first come to ballet? I was so little! My mother took me when I was about 5 to see the Ballet Russe de Monte Carlo. They did Coppélia, and I remember being so overwhelmed by the orchestra, the curtains, the lights, that I started crying. At that age I was too young for the School of American Ballet, so my mother took me to the Dalcroze school, where I learned tempi and meter and things like that—well, a young person’s version of them. Later, my mother asked me if there were a special ballet teacher I was drawn to. I thought Madame Maria Swoboda was a queen, and I started studying with her. The lessons were a present from my uncle for my ninth birthday, I remember. I was thrilled by ballet. We used to go to the beach in Saybrook, Connecticut each summer, and when the tide would go out, I’d dance on the sandbars. What happened when you began touring with the company? For two years, everything went very well. We had many foreign people in Ballet Russe, lots of South American dancers, so most of the time I didn’t have to worry too much; we all looked a little different. I got some nice solos to do, like the Waltz in Les Sylphides. Then I started to have problems. I remember one time in Montgomery, Alabama, the tour bus rolled into town, and everyone was running around with white robes and hoods on. They stopped traffic, there were so many of them. There was a rapping sound on the bus door, and this man jumped on in his hood and gown. Several big strapping male company dancers got up and moved toward him. He threw a fistful of racist pamphlets all over the bus before they chased him out. That afternoon, when we got to our hotel in Montgomery, a bunch of us went down to the dining room for dinner. When we walked in, it was full of lovely couples, families with little children—a wonderful family atmosphere. Then, as I pulled out my chair, I realized that they all had Ku Klux Klan robes on the seats next to them. I remember thinking, here are people who can be so cruel and ugly, and yet they’re so loving toward their own families. In a way it made me less frightened of them. They lost some of their power in my eyes. Carmen de Lavallade has had an unparalleled career in dance, theater, film and television beginning in her hometown of Los Angeles performing with the Lester Horton Dance Theater. While in Los Angeles, Lena Horne introduced the then 17 year old de Lavallade to the filmmakers at 20th Century Fox where she appeared in four movies, including Carmen Jones (1954) with Dorothy Dandridge and Odds Against Tomorrow (1959) with Harry Belafonte. During the filming of Carmen Jones, she met Herbert Ross, who asked her to appear as a dancer in the Broadway production of House of Flowers. Her dance career includes having ballets created for her by Lester Horton, Geoffrey Holder [whom she’d end up marrying], Alvin Ailey, Glen Tetley, John Butler and Agnes de Mille. Carmen de Lavallade succeeded her cousin Janet Collins as the principal dancer with the Metropolitan Opera and was a guest artist with the American Ballet Theater. She has choreographed for the Dance Theatre of Harlem, Philadanco, the Alvin Ailey American Dance Theater, and the productions of Porgy and Bess and Die Meistersinger at the Metropolitan Opera. See also: The Breakthrough: A Conversation with Misty Copeland, Carmen de Lavallade and Raven Wilkinson. Arthur Mitchell was not only the first African American male dancer in a major ballet company, he was the first African American principal dancer of a major ballet company, elevated to the role at New York City Ballet in 1956. Mitchell later started the famed Dance Theater of Harlem. They laughed when Desmond Richardson auditioned for the High School of Performing Arts. He had never had a dance class. He was chubby. And all he could think to do, dancing to a street music tape, was imitate the moves he had seen Mikhail Baryshnikov perform on television. Nobody is laughing now. Over the past two seasons, Mr. Richardson has been singled out by critics and audiences for his dazzling technique and charismatic presence. At 22, he is a leading dancer with the Alvin Ailey American Dance Theater, and on Thursday he will perform the Baryshnikov role in “Pas de Duke” at City Center. In 1990, Lauren Anderson was the first African American ballerina to become a principal for a major dance company, Houston Ballet. Anderson, now retired, was onstage at last year’s Swan Lake curtain call celebrate Misty’s achievement. Cisneros beat a path for women of color, too, and became a major figure in the San Francisco Bay Area dance scene for more than two decades. She is considered the very first Hispanic prima ballerina in the United States. [B]ut it almost didn’t turn out that way. She discovered her talent entirely by accident when her mother encouraged her to try ballet as a way to overcome the shyness that had taken over her once bubbly personality. She found a mentor in her first teacher, Phyllis Cyr, and eventually followed her to a new studio to be her apprentice. To pay for the expensive classes, Cyr hired Cisneros’ mother to work at the reception desk.